This is the latest installment of our weekly series The Language of the Blues, in which author and rock musician Debra Devi explores the meaning of a word or phrase found in the blues. Grab a signed copy of Devi’s entertaining & award-winning glossary The Language of the Blues: From Alcorub to Zuzu (Foreword by Dr. John) at Bluescentric.com. Also available as an eBook. The shout, or ring shout, was a shuffling circle dance around a centerpiece of some kind–usually a table–performed by singing and clapping worshipers in the black Sanctified and Pentecostal churches of the South. In The Land Where the Blues Began, Alan Lomax pointed out that for many years church was the only place in the Delta where African Americans were allowed to congregate. The long worship meetings were the community’s main social events, and they were full of singing and “shouting”–which really meant dancing! “The body can be used as a trumpet by the spirit,” Miss Cotrell declared. This use of “shout” has been traced to the Bambara word saut. The Bambara came from what is now The Republic of Mali (formerly French Sudan), in West Africa. Scholars believe the Bambara saut is identical to the Arabic saut, which describes the circumambulations pilgrims make around the Kaaba (or Ka’abah), the large granite cube in the center of the Sacred Mosque of Mecca (Al Masjid Al-Haram). The Kaaba is the most holy site in Islam. When Muslims kneel and face East to pray, they are turning toward the Kaaba. 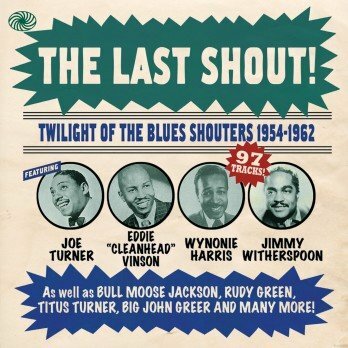 The word shout was used in a different way to describe how early blues singers sang to be heard over their bands. Blues singers in Kansas City used their shout muscles to belt over their bands, bearing down into their diaphragms the way gospel soloists do to be heard over the choir. Blues singers like Joe Turner and Jimmy Rushing “first were heard literally screaming over the crashing rhythm sections and blaring brass sections that were characteristic of the southwestern bands,” Le Roi Jones (Amiri Baraka) explains in Blues People. The radio beamed the new shouting blues all over black America. The style was taken up by country blues singers like Muddy Waters and T-Bone Walker, who had moved to Chicago and were leading electrified bands. Meanwhile, sophisticated shouters like B.B. King and Jimmy Witherspoon emerged to lead the charge toward R&B and rock ’n’ roll.